I have just made my way back to Malmö in Sweden where I live after what I would call a fairy tale Expedition! I have just travelled 650 km.s through some of the most spectacular winter landscapes, I have ever come across during my 27 years of exploring professionally. I have done this with the help of 35 reindeers, 16 sleds, 3 Sakha friends and 4 Eveny reindeer herders. We travelled from the village of Uchugay in Yakutia, located about 100 km:s south of the Pole of Cold, Oymyakon, where the lowest temperatures have ever been recorded as the coldest inhabited place on earth. -67.7 back in 1933. The journey took us along an old trading route which has possibly been used as far back in time as 1640. The Russians used it to reach the hinterland all the way up to the new trading post at Yakutsk. The Russian Yakutsk was created 1632, but the Sakha, or Yakut, which the Russians call this people, arrived hundreds of years earlier and have been settled here since this time. It was never used to “transport” Gulag prisoners during the Stalin atrocities, they came into Magadan, not the harbour in Okhotosk. And Yakut horses as much as reindeer have been used as transport vehicles, but only the reindeer is still used today. 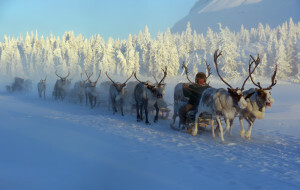 And the reason for this is because that the Eveny of the Chabarovsk krai, still live a life which is very nomadic and in the taiga, far from any modern villages, the reindeer is superior to even the snowmobile. Because it needs no fuel, can go anywhere and survives easily. It took us 50 days to cover this distance and the first part was dominated by an extreme cold down to temperatures just above -60 degrees Celsius, but offered a winter landscape which was awesome to say the least! About half way we crossed a mountain pass and went down into the Khabarovsk Krai, the home region of our four Eveny herders who were taiga people, not tundra folks, at a lower altitude and a more coastal climate, so temperatures rose and we had wind instead. Not bad, but more than on the Yakutian side of the border. The highlight was experiencing this unique life style which our Eveny members showed us. Much of the year, they lived as nomads, herding their reindeer at the same pastures and on the same routes that has been used for maybe 2500 years, when the reindeer is said to have been domesticated in this region. Life today had changed, of course, but many things have been the same ever since this time. 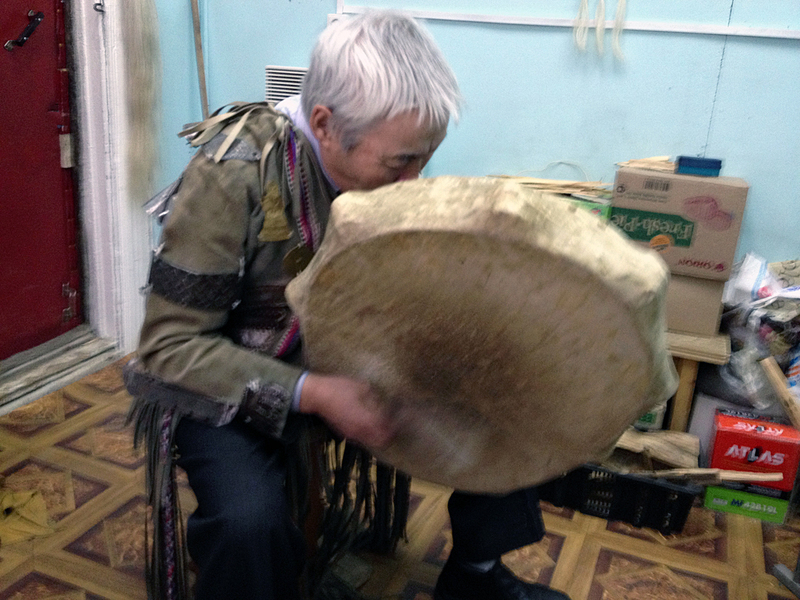 Back in the capital of the Republic of Sakha, Yakutsk, I met with two shamans and recorded this unique experience. At least for me. I also had a chance, on route, to visit breeders of the Sakha horse (Yakut horse), and even though little is known about it today, and a terrible program of cross breeding during the Soviet Era almost killed it, it is still alive and kicking! 1. Extreme cold, how it affects human beings and the difference between the local Eveny and domesticated non native people (like an explorer). Imagine this; Minus 98.7 degrees Fahrenheit (-72.6 Celsius) is the lowest temperature that has ever been recorded on inhabited land. The thermometer that did so was in Oymyakon in north-east Siberia. There, the permafrost is one and a half kilometers deep and the remains of mammoths over 10,000 years old have been found, almost perfectly intact. For much of the year, daylight is nothing more than a faint glow on the horizon in the middle of the day. At 94 kilometres per hour, howling winds of unimaginable ferocity sweep over these empty spaces where brown bears weighing up to half a ton wander among the Siberian taiga and its alpine mountains. Siberia accounts for one twelfth of the earth’s land surface and is almost 14 million square kilometres in size. It takes seven hours to fly from its most westerly point in the Urals to its most easterly outpost on the shores of the Pacific Ocean. The only people who manage to survive here are the Eveny reindeer. They are perfectly adapted to survive under these extreme conditions. The average winter temperature is minus 35 degrees Celsius, but it often dips to minus 60 degrees. At such times mercury freezes solid and brandy becomes the consistency of syrup. It is so cold that trees explode, blue sparks fly from falling timber and when somebody exhales, their breath is transformed into a shower of ice crystals, followed by a tinkling sound referred to as “the whispers of the stars”. I want to investigate, throughout this trip, how much genetics, choice of clothes, training or adaptation makes a difference to how you adapt to the cold. By observation and tests. For example, I remember during my last two trips to region, on the first, one of the locals, in -58 degrees Celsius, worked pulling up water from a hole in the ice with his bare hands. It should be impossible, but it happened. A native Yakut. 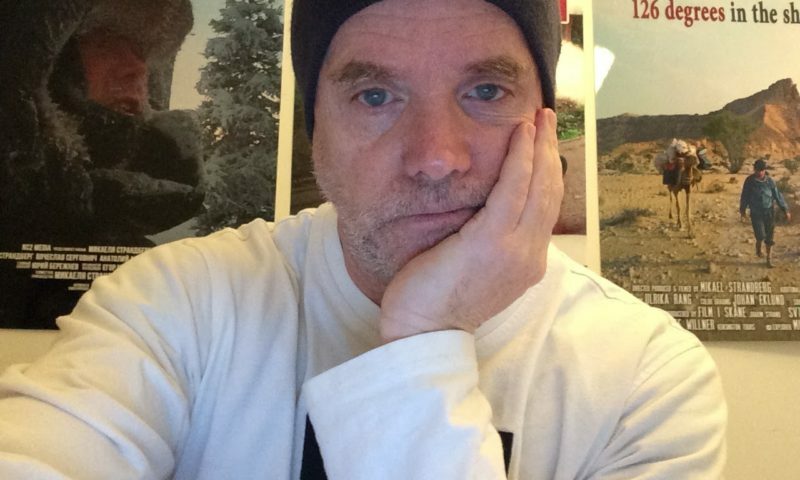 On the last trip, a year ago, contrary to what Scott and his men learned on the South Pole, as regards to their sleeping bags being made of fur, which when they got sweaty and wet turned into a deathtrap, because when the liquid froze, they had problems getting out of the sleeping bag and froze badly throughout the night. As told in Apsley Cherry Gerrard´s legendary book The Worst Journey In the World. 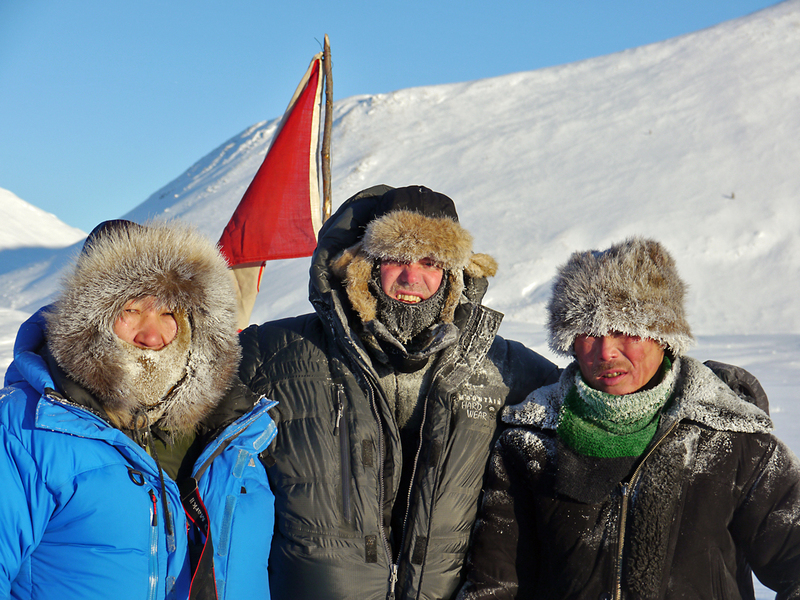 However, when filming the Eveny last year, in -54 degrees Celsius, they started every day by running as fast as they could until they started to sweat profusely, because they said this would keep them warm throughout the day and the night! For this reason I have invested, on top of modern polar clothes, in an all traditional Eveny reindeer fur kit! I believe, in a world where more extreme weather is to be expected in the nearby future, that such knowledge will be extremely vital and important. Documenting native and historical knowledge as regards to the Eveny people of Siberia and how they travel by teams of reindeer pulling sledges. The world around us is still in a dramatic modernizing change and a lot of old wisdom gathered throughout millennia is by the day getting lost. One of the most unique of these knowledge’s is the survival of humankind and its domesticated animals in extreme cold. The Eveny people, today only numbering around 20 000, have lived in this area of North Eastern Siberia that we are going to travel through for most likely 5000 years. 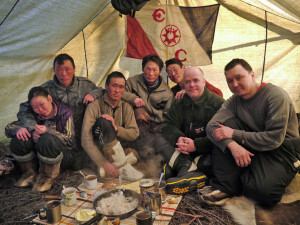 Their survival, and for a few still, has been farming reindeer plus hunting and fishing. The reindeer is a migrating animal, both the wild and the tame, and the Eveny have historically followed their migration. About 2500 years ago, the Eveny domesticated the reindeer and initially they used dogs who pulled their gear, but eventually they would train the reindeer not only for riding but also pulling sledges that they built to perfection themselves. Today of course, very few Eveny travel like this, but some actually do. 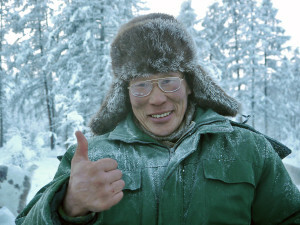 There´s a few families living in the coldest inhabited place on earth, around the Oymyakon area of Yakutia who still stay true to this utterly unique way to travel. Unfortunately, there´s a major chance, basically due to the fact that these Eveny who still have the skill, don’t have a family. There´s very few women who want to live in this the greatest and most untouched wilderness on the globe. So it just has to be documented for the after world before it is too late! So not only will we document this unique way to travel and live, but also the construction of the sledges and the farming and training of the reindeer who do the job. 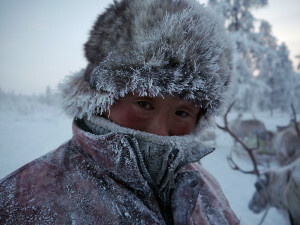 For this reason we will travel 600 km:s through the wildest territory on earth, teeming with bear, wolves, wolverine and fresh air, and document this most likely freest of life’s and most unique way to survive in the coldest inhabited place on earth – Oymyakon in the Verkhoyansk region. When I traveled down the Kolyma back in 2004-05 I came across a native horse called The Yakut Horse which few had heard about. I wrote story about it and it was hailed by The Long Riders Guild as a discovery. It´s origin is still clouded in mystery, but there’s at least 10 000 wild Yakut horses in Yakutia and half as many in farming/breeding. It is presumed that it has inhabited this area as long as humankind has existed here, but nobody knows for sure. It is probably one of the oldest breeds in existence. 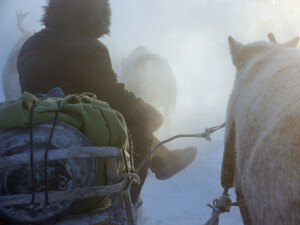 The Yakuts are a historical horse people, who farm, hunt and eat the Yakut horse, but the exploration of this the coldest inhabited part of the world would have been almost impossible without this unique animal. Still today native people use the horse to reach the remotest parts. And since one of my partners on the trip Yegor Makarov is the biggest promoter of this beautiful horse and its place in Yakutia, we together want to find out more about its history, whilst travelling to these unknown mountain villages. Some of which are said to be inhabited by Yakuts and their horses. The word shaman originates from the language of the Eveny and the Evenk, two closely related people of the Tungus language family. The role of the shaman is closely linked to hunting as a way of life. Before the development of agriculture some 10 000 years ago, all humans depended on hunting to survive and its hard to imagine any other kind of religion could have existed. 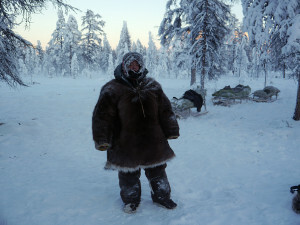 In Siberia, shamans are closely linked to the reindeer and although it is said to have been almost exterminated by the Communist, the rumor says it is flourishing again in this part of the world. The Even who live in the wilderness, in the Siberian outback, are a very superstitious people, where they in one way or the other communicate with the spirits for pretty much everything life, like good hunting, good sleep and so on. For example, every time you start a fire, you chuck a glass of vodka in it before you do anything else, to placate the spirits. Even though the world has a wide knowledge of Siberian shamanism today, I would still like to document on route the presence of shamans and in what way they influence the lives of local people today. I have to say I am very happy to acknowledge that in this little time, 2½ months, I was able to, with the help of all the people I came across, realize major parts of the main objectives of the trip. Let me quickly add, there’s still a lot to do! My primary goal was Documenting native and historical knowledge as regards to the Eveny people of Siberia and how they travel by teams of reindeer pulling sledges. Scientists today pretty much agree on the fact that the domestication of reindeer started in this are about 2500 years ago and that they figured out about 1400 years ago that the reindeer is better than any other animal to travel long distances, so they copied the dog pulling sleds and made them for their reindeer. A unique practice which still survives today through a few reindeer herding communities in Siberia. I spent about 1½ month together with a group of Eveny herders, which one can call semi-nomadic, since they spend 11 months a year in the wilderness tending their herds and hunting, sometimes fishing, to stay alive. They return to the village mainly to see family and recharge their batteries a bit by watching TV. Of course life has changed for them the last hundred years, due to communism and today a difficult capitalistic era, which is very far from their way of living. The Soviet era agreed with many of them, since the idea was that there wasn´t any classes and everybody had the same value and shared everything. And since most of them lived out in the wilderness, they didn´t come across the worst Soviet practices but mainly went about their lives herding reindeer. They actually have less today, than during the Soviet time. The herders I lived together with, they have lacked any support from the state, since the arrival of perestroika. Where they before had for example vital items such as ammunition, guns, petrol, health care, vacation every two years, they barely survive today. Any they have gone back to their old ways to eat, basically avoiding all the Russian food like salt, flour, butter and so on, eating more meat and intestines, fats of reindeer and so on. A healthier living to a certain degree, but they have gotten used to the Russian food. 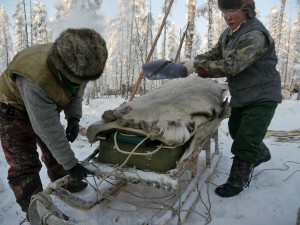 Due to the hardship they live under, they use every single part of the reindeer and other animals like moose, mountain goat, to sustain themselves, their sleds and they only use some nuts and spikes to fix emergency repairs on their sleds and of course, tents and wood stoves are all modern today. Otherwise it hasn´t changed that much since they figured out the sled! Slava is one of my oldest Siberian friends. I met him back in 2004 in the village of Kolymskaya when he was guiding a group if Finnish EU-observers. he is one of the three most important Yukagirs alive today. Just as his grandfather predicted jut awhile after his birth. It is a joy to be with Slava. It was important to me to introduce him to my family, especially my wife, because I wanted to influence her a bit as regards to what she should choose to do her PHD on. Because for me, there´s a significant difference between the Yakut and the Indigenous groups of Eastern Siberia. The Yakut is very much European in my mind, but like the yukagirs and the Eveny´s that I know a bit, they have this completely amazing serenity and open heart. Still. You easily realize that they´re still trying to adapt to a life style which is so akin to their ways to live. Basically that everyone is of the same value, have similair lifestyle and share everything. So far from a capitalistic life style one can even imagine. The yukagirs impressed me more than any other indigenous group I came across on the Siberian Journey 2004 and 2005. One of them was an old lady which is a relative of Slava. Most people from Nelimnoye are his relatives he laughes. I found out she died two years back. She made such a strong impression on my friend Johan Ivarsson and myself in that time. She came from a family of shamans. And she had dreamt about us much before we arrived in Srednekolymsk. Meeting people like Slava is refreshning. Not only because one laughes unhindered and pure. Laughter doesn´t otherwise come easy to the Yakut for example, they´re generally a very serious people, but very good, but as I have noticed over and over with indigenous people, laughter is always close at hand and comes easily once the first shyness is gone. And they feel so…pure! And Slava taught us a lot about the situation for most indigenous people in the north-east right now, since he is involved a lot with the future of these important people. Right now he is somewhere in Western Russia at the most important of conferences for the Indigenous People, he is one of three Yukagirs, when they have a chance to talk to each other and the government. “So what are the biggest obstacles for indigenous groups in this region to continue their way of life?” I asked. “Don´t give me more food, because if I don´t eat a lot when I get home, my wife thinks I have another woman! Secondly I wanted to determine Extreme cold, how it affects human beings and the difference between the local Eveny and domesticated non native people (like an explorer). These are words from a well known polar scientist. After having spent two major Expeditions in what is considered extreme cold, I have some lessons learned to share. The most important one, surviving in extremely low temperatures is basically a state of mind. And too some degree genetics and acclimatization. 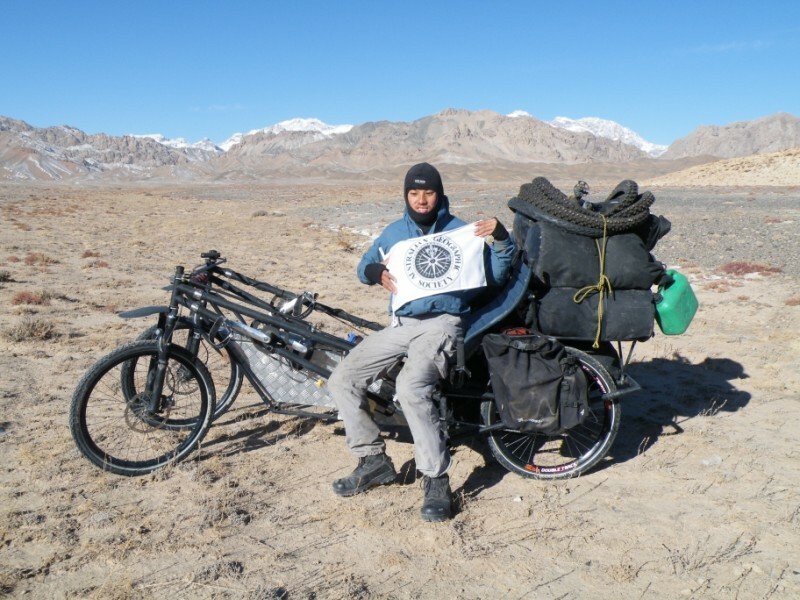 Let me first tell you about the two expeditions I have done in extremely low temperatures. The first one I did back in 2004-05, spending a whole freezing winter skiing down the Kolyma River in Siberia, average temperature around -48 degrees Celsius. At times as low as -58. (My friend Egor Petrovich Makarov disagrees on that specific temperature, because he says it isn´t that cold along the Kolyma, at the most -52. Now, after this last experience, I know it was that low!) 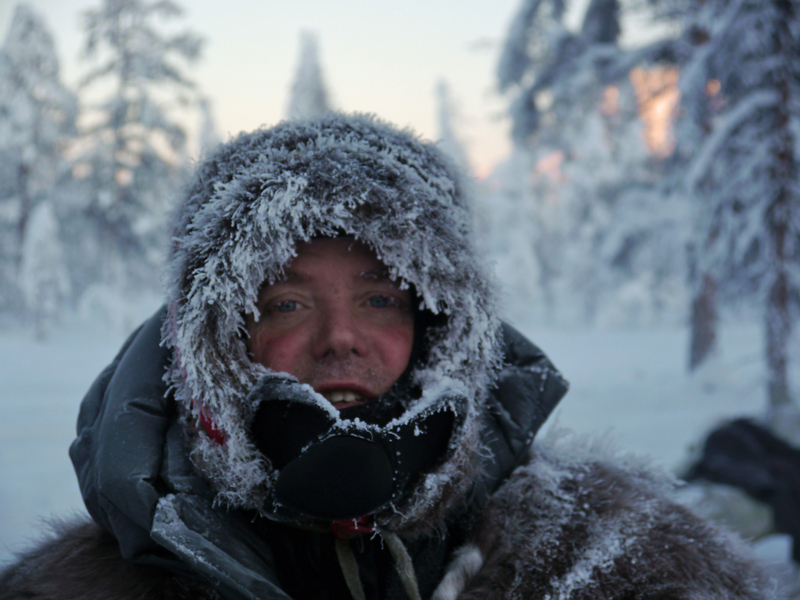 We spent many nights, months, without any heating in the tent, Johan Ivarsson and I. After having just returned from this latest Frozen Frontier Journey, I don´t know how we survived the Kolyma Expedition. But we did. Even though we were sweaty and pulling 330 pounds of weight each. Neither can Egor understand how we survived. That is how cold, real cold is. One thinks one is going to die. But we didn´t. Because we had the right state of mind. The second one, just finished, the Frozen Frontier, 50 days travelling 650 km:s from Oymyakon to Arkah by reindeer and sleds. Temperatures were generally lower, averaging around -48 degrees Celsius, but with more days of real low temperatures. But we did very little physical hard work, but instead we sat more or less motionless on the back of a sled pulled by fast running reindeer. Since I have just returned from this one, I remember this pain more. Because that is what you feel after 2-5 hours each day at the back of a sled in extreme figures. Pain, especially your feet. On this journey we had wood stoves, but initially the one we had in one tent, was so bad that we had problems sleeping and relaxing until temperatures got a bit higher, meaning higher than -50. Because there is a major difference between -40 and -50 degrees Celsius. And even bigger between -50 and -60 degrees Celsius. One of the first days I walked out of the tent, with a cup of hot tea in my cup and I wanted to get rid of it, so I threw it up in the air. It came down tinkling in crystals. It was beautiful. And it was just after 10 in the morning, so not as cold as at 4 a.m in the morning. Siberians says this is a good measure for temperatures being around -50 degrees Celsius. One thing you do learn, is to tell the differences is cold temperatures. It is easy to know when it has gone down to close -60 for example. When inside a tent for example, like the Siberian version of today, which isn´t really adequate for these kind of temperatures, but cheap, it is hot and nice at the ceiling of the tent, but on the ground level, even if one has put ample thickness of dry branches as a floor, everything down there is still frozen and most of the time, I spent hours every evening sitting on my mat transferring the days footage together with Yura. Fully dressed most of the time, if not, always using the down jacket as a barrier against the penetrating cold. The nights were much easier this time though, since no major physical work had been done, no bodily sweat and the wood stove drove away the worst cold after a couple of hours. 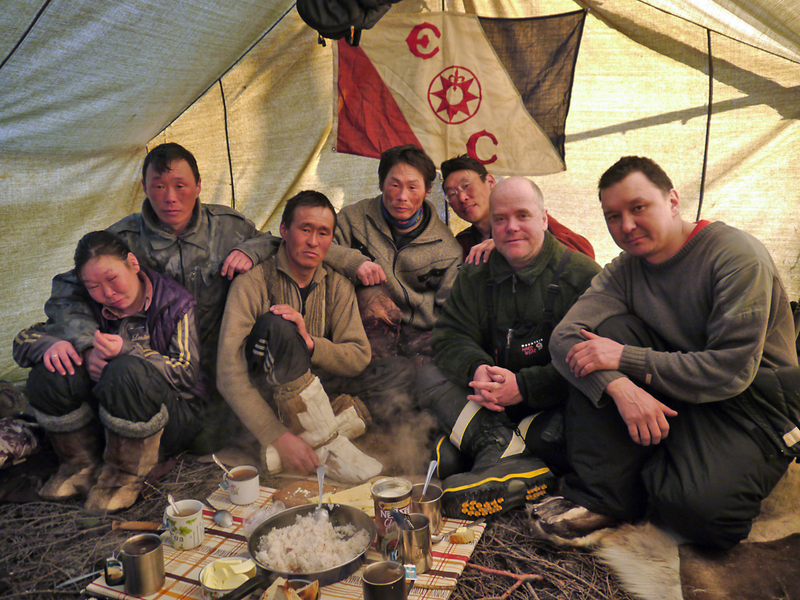 On the Kolyma expedition we froze and shivered with pain the worst nights and it was impossible to sleep. Since I had spent 3 years in the Arab world, most of it in hot deserts, I was badly prepared for this cold this time and as quick as I got off the plane, my old frost nips on the cheekbones appeared and plagued me through the trip, but I covered up properly and with the help of especially Egor and Yura, I kept it under control. One has to take care at all times. My team members had some problems as well, especially Yura Grigorovich, who had two badly infected cheek bones from frost bite, but cured and treated it with dogs fat. But his skin is still disfigured, but he picked it up on before we set off together. It looked real bad, but the dogs fat did the job. Otherwise, sure, if you live in these temperatures regularly, you have major advantages. Even the freshman in the group, Bolot, had no problems at all with frost nips or worse. But, we never spent more than 6-7 hours outside in a row, without getting indoor heat from the wood stove in the tent. In this of course, is a life saver. Even locals die in this extreme cold. One story I heard was about an experienced herder, who in -50 just wanted to go outside the tent and get some new firewood, which is the major hard work out here and once he got outside, his tent caught fire and he hadn´t done what he should have before leaving the tent, leaving his big fur coat on the outside as a security. So he froze to death even if he was used to this cold and had only 25 km:s to some kind of help. So the right choice of clothes is important! One of the minor goals of the Expedition beforehand was to do a proper test when it came to fur versus modern polar kit. Egor had set me up with a full fur outfit from Andrushkino in the Kolyma area. I paid 2000 dollars for boots, gloves, trousers, jacket and hat all in reindeer skin. He said that one could sleep outdoors in that kit only, no matter how cold, as long as one covered oneself in snow. When I first saw it I thought it was beautiful, but looked extremely bulky. Even though I had sent over my sizes, gloves and boots seemed small, but I thought it probably had to be like that. 3500 years of knowledge was put into that kit. My modern polar clothes came from Mountain Hardwear, TNF and Termo. The boots came from Baffin and promised to keep cold at bay even if it was -100 degrees! the difference with the fur was that it was more flexible, comfortable and one didn´t have to take care of it as much as the fur. But, of course, in the sharp taiga, down is no hit, so I lost a lot of down on this trip! At the end of the journey, I had mixed the two. Biggest problem were the feet. As it turns out Baffin Boots wasn´t good enough. Too heavy in deep snow, slippery on ice and not warm enough! I also used Termos double socks, one pair only. I ended up using the reindeer boots, which still weren´t the right one´s for the taiga. It turns out two mistakes were done from the beginning. First of all, the fur kit was brought indoors, which made it stiff, therefore my trousers broke immediately. And were therefore useless. Secondly, the andruskino kit was made for the tundra, which is a windy, flat, icy expansive of Arctic desert. 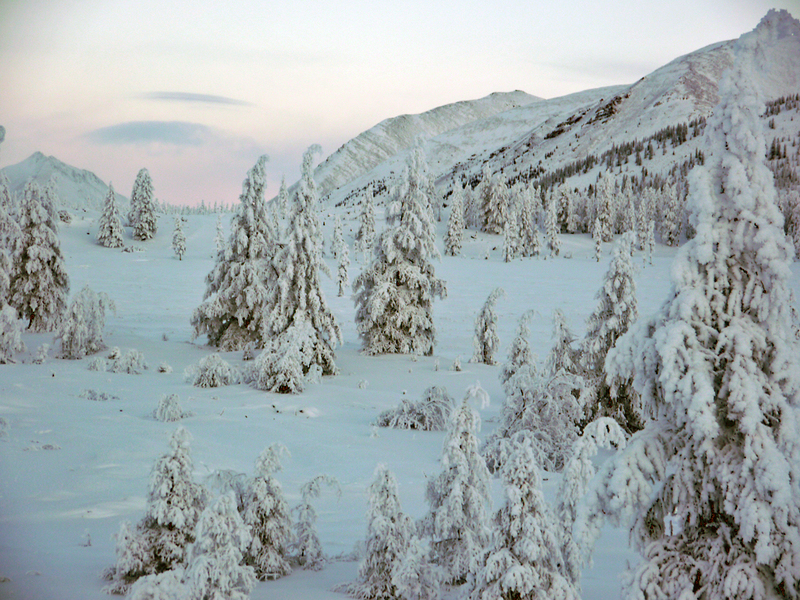 We traveled in the taiga, with very little wind, but deep snow and dense forest. So this kit was too bulky, heavy and really, totally wrong. For example, the boots, which I did use all the time and which were better than the Baffin boots, were ankle high, but should have been knee high, the inner boot was too thin, so the Eveny gave me one of theirs, a knee high inner boot. This worked well, except on snow, because the sole was made of fur, good on the tundra, like skating in snow and on ice. 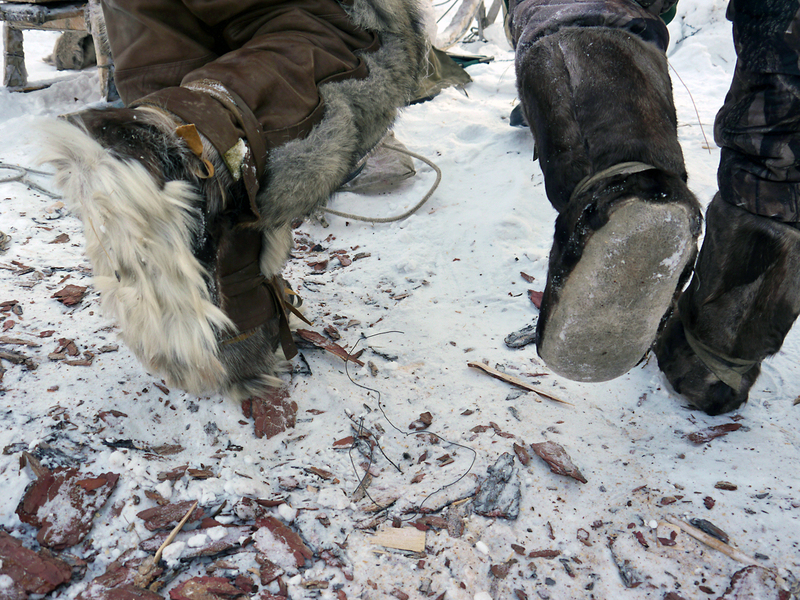 the Eveny taiga herders have a sole made of moose, with the inside out. Another issue which made the fur kit almost useless on this trip was the lack of a detail covering up the neck. Yura Stepanovich decided to try to sleep in the fur kit only one night in -40 Celsius, but suffered from the lack of this details and a belt keeping it all together. It was just the wrong kit. 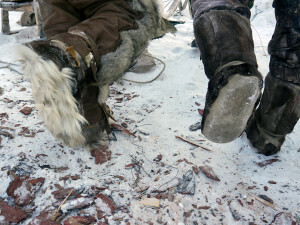 So I used the boots, which did the job, even if I was terribly cold at times, and than modern polar gear. The jacket was perfect, the mittens slightly cold at times, but more than good enough, I mainly used the thin polar tech gloves anyway, I just don´t freeze in my hands, the trousers just ok, at times, too cold at the knees and on the thighs and it took a lot of damage from sharp twigs of the taiga. The face mask was perfect, my old hat not that good, a big mistake, but the down hood on the jacket took care of that and I used double long johns, double long shirts from Termo and this worked well. I also had some thinner trousers on. So quite a few layers and as a whole, it di its job. One thing I was stupid enough to leave behind was a down vest. Sunglasses and ski mask was impossible to use until temperatures went above -30 Celsius. So, modern polar gear stands up to the cold, its weakness is on the boot side. Especially if there´s no physical work as such involved. My photographer of the documentary on this trip, Yura Stepanovich, worked almost all the time without gloves or mittens. Only somebody from the region could do that and since he is half Sakha, it means he does have the genetic advantage of the Hunters reflex, which allows locals to withstand cold more than others in their hands. But as I said initially, otherwise it is all up to your mind work. And, putting on a reasonable amount of fat, makes a difference. I lost 15 kg:s by eating good local food, working a bit more than normal, but most of all using the energy from the fat to keep the cold at bay. So, a non-local, needs more fat! Remember, even if you have my experience, 27 years of living outdoors, 2500 nights in a tent and lots of time in extreme temperatures, don´t mess with the cold. Prepare, acclimatize properly, eat like hell beforehand and during the trip, fats, and enjoy it. It took me ten days to withstand the cold to fully enjoy this extra ordinary journey. I could only put all my concentration into withstanding the cold! However, having said all this, it is a very beautiful time of one´s life, a winter landscape in extremely low temperatures! Thirdly I wanted to investigate the situation as regards to the unique Yakut Horse. 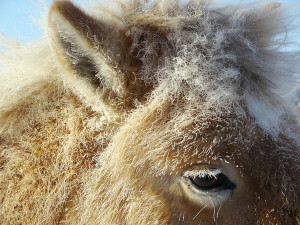 My expedition partner Egor Petrovich makarov has put a lot of money and effort into preserving and highlighting the existence of this unique horse. And there´s breeders all along the traditional horse villages we passed on our way to Oymyakon, like the village of Tomtor, where the breeding is going very well and it is run in a modern and efficient way. So there´s no worried for the survival of the Yakut horse at this moment. And finally, I wanted to investigate the existence of Shamanism. I met two people with the power, none of them wanted to call themselves shamans, ut others did. Or said they weren´t shamans. Most people I met just felt uncomfortable talking about them. I met a younger one, Alexander “Kulan” Artemyev, and an older one, Afanasiy Semenovich Fedorov. Both would have been imprisoned or killed during the Soviet Era. Since I have returned back to Yakutsk I had received emails and phone calls telling me that shamans still existed and that one could be found in Yakutsk. Shaman is a word which originates from the Tungus family of languages, like Eveny and Evenk. 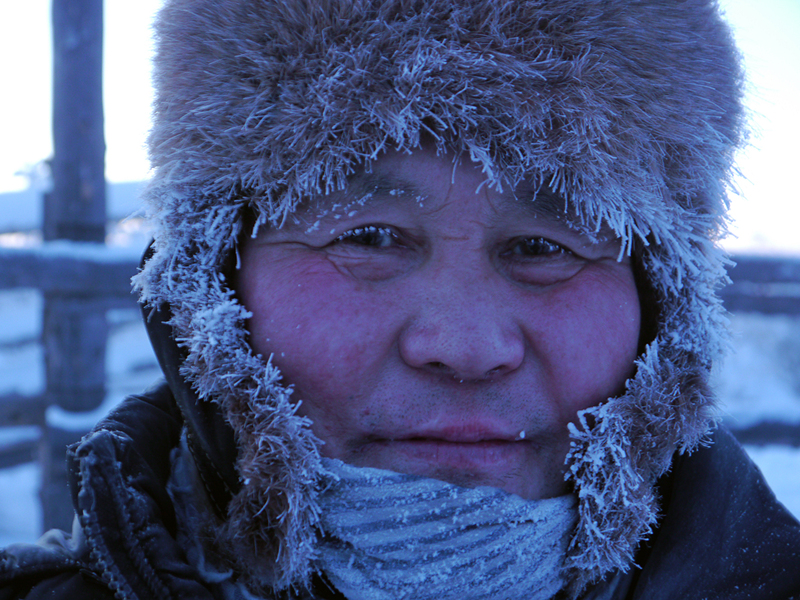 And during the Expedition from Oymyakon to Arkah I asked several Eveny´s, young and old, if shamans still existed. They all said that they had heard about it, but never met one and that they were all killed during the Soviet Era. 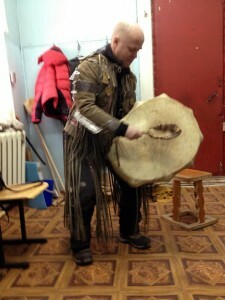 And after all together 1½ year of travelling in Siberia, I have never met or come across a shaman either. So, I was kind of apprehensive when people told me to meet Kulan, or Alexander Artemyev. He even had a personal Facebook page and as far as I knew from the world of shamans, if you are one, you don´t go about telling others. that you are. Which he didn´t on his Facebook page, but do shamans connect with social global media? Why not I thought, we live in a constantely changing world. So, I contacted Kulan and it would be a shocker of a meeting for me. He sat down next to meet, clinched his fists, told me to do the same, and put me feet firmly on the ground and he told me to close my eyes. I was in shock. Now, yes, all he had said so far was spot on. For years I have had an enormous amount of stress due to…life. My brain worked day and night. The reason, I want to be able to support my family. So in 1½ year have done 3 big Expeditions and coming back from this last one, I have been extremely tired. If I had any doubts of is capacity, I believed it now. And since one of the pillars of exploration and life itself, is to dare try things even if they scare you. So, I let go. ”See yourself inside a yurta (tepee)” , Kulan said whilst I heard he took out a drum and started to beat it slowly and suggestive. He than took out like a brush made of horse hair, made a small fire, beat me with something sharp and the pain was enormous. He pressed the back of my head so hard that I wanted to scream, but I still wasn´t relaxed enough. I was to worried what my two daughters would think, but according to Pam, my wife, that looked at it all in silence. Which is very unlike my daughters. I smelt the fire, the smoke, a mouth harp start playing and than again the drum. And the bodily pain. I felt more tired than ever. the Shaman told Pam to go to me, hug me and comfort me. My wife is extra ordinary woman and on her mother´s side, originating from the thaidam tribe, they have shamans. I felt an enormous grief, so did Pam. In the meantime Kulan was beating the drum. Afterwards I was told he had put on skins as clothes, the drum was big and beautiful. I felt this chilly cold inside me and this was a very panful time, both physically and mentally. I hurt! I heard myself gruffing, I had an urge to howl, but rationalism mad me avoid it and I was moving together with the drum beats, sitting down. Suddenly it was over. Kulan gave me a very powerful hug, we hugged and he looked profoundly at me. Than we went in to the kitchen all of us and had lunch. At least I thought it was lunch, because it was almost 5 in the afternoon. It had taken 4 hours to sort out my worries. Not very surprisingly he shook his head. 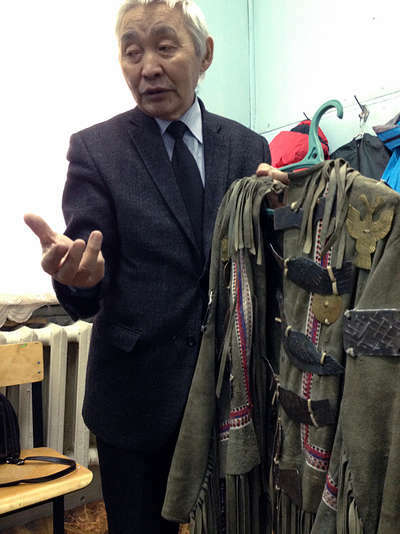 ”Alexei Kulakovsky is the compass for us Sakha” , Afanasiy siad slowly and with a low voice; ”He was a very simple man, poor, who travelled by foot throughout our republic to see how people lived. And he died in Moscow, poor and in ill health. For him, he would see them as destroyers of the nature where all big spirits abide. Which is against everything many of us Sakha believe in. 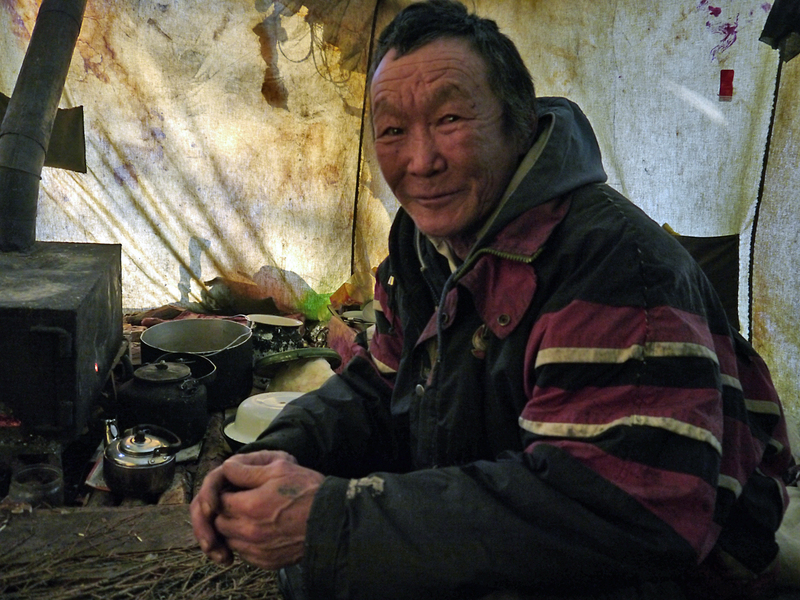 Once you get to know the Sakha a bit, you realize many of them, especially the elderly, detest the name Yakut. A name given by the Russian colobialists as they see it. They want to be called Sakha. And since they have started to revive their traditions and beliefs that for 50 years where forbidden by the Soviets, they are, of course, in my mind slightly nationalistic today. Most in a good way, some in a less good way. I am personally not very fond of any nationalistic tendencies. But Afanasiy impressed me. Even though the Sakha don´t see themselves as an indigenous Siberian people, which they ain´t, they do revere the nature as any other Siberian group of people. With a mixture of fear and love. They love and understand it, but worry about the spirits. Few know them better than Afanasiy. ”You see, when using the drum, it is divided in three parts as the world looks like. The under and upper world and the middle one we are in right now. And depending who you communicate with, with the help of your body and how you play the drum, that is how you communicate” , he said whilst he showed me how to use it after he had dressed me in a quite proper shamans outfit. A real shamans outfit weights about 48 kg:s, because it is full of heavy metal plates, which are there to confuse and stop the evil spirits which abide out there. Some have the shape of female breasts, since the spirits fear women, other just a solid piece of metal, just to stop them harshly when they´re trying to take over your being. For me, who have heard many stories about the shaman drum and its potency, I felt slightly uncomfortable, because this was a holy drum done in the right way more than 20 years ago. I drummed hesitantly, but its sound is comforting and exiting. On the wall, Afanasiy had taped up photos of shamans he had aquired during the years, because he is also a great preserver of the Sakha culture and traditions, especially the shamanic part. One of the shamans differed from the rest. Who looked dangerously crazy. I noticed he died 1935 during the Stalin purges, when the Soviets were imprisoning or killing all shamans. Everyone except a female shaman on the wall, had been imprisoned. So I asked Afanasiy if this particular shaman had been killed by the Soviets. Afanasiy is not a very loud person or anybody who needs attention to his own being. And this is, I think, a very much Sakha thing of how to behave. And Anafasiy avoid all modern music, anything load he could, because it was against the proper behavious of the Sakha. But he understood life was changing and it was hard to stop. The theatre play we watched was a modern version of Kulakovskys poem, which basically is full of worries that the Sakha will be overtaken by an extrenal force like the Chinese Japanese or Americans and Kulakovsky was for inegrating with the Russians, well rock music and loud sounds dominated todays version. I liked it. So did me wife and the kids. And I think it mirrored todays Sakha which is quickly moving into the consumer society, but tries to hang on to some of its very sound and healthy traditions which deals with nature. And for me personally, the Sakha are a really generous and ind lot of people, where I have met some of the most ambitious people I have ever come across, one of them travelling with me on the big journey, and some of the most low key and kind I have ever met. A fascinating people! I enjoyed reading your adventure, thank you.